Now that the food world has woken up to the nutrition-boosting powers of purple foods, pantry additions such as beetroot powder are seeing all sorts of exciting culinary manifestations. Incorporating anthocyanins, the flavanoid pigment responsible for all this health boosting, might sound like yet another layer of complexity to the already challenging healthy lifestyle diet, but once you know how versatile this ingredient is, you’ll be mixing it up in the kitchen (and in your beauty routine) in no time. Here’s a rround-upof inspiration on things to make with beetroot powder. If you’re as big a fan of homemade pasta as I am, the thought of adding some beetroot boost is a pretty exciting thing indeed. Try ChewTown’s take on beetroot powder fettucini. Whoever said decadent truffles had to be bad for the hips? Culinary powders are upping the game on sticky, health-filled truffles. Give Lazy Cat Kitchen’s amaretto truffles a whirl. Red velvet cakes, cupcakes and layered cakes exploded on the food scene a few years back. But did you know the modern food colouring counter parts actually belie the red velvety origins. Red velvet cakes originally came about because of beetroot. Give natural red velvet cupcakes a go in a simple recipe by Small Kitchen Tales. Beetroot smoothies, juices and shakes pack powerful antioxidant punches, but can leave quite a mess. Not when you have beetroot powder at hand. Give this pink power smoothie by Devote a blitz for a proper pre workout shake. Looking for a super healthy dip, that will not only look great on your entertainment spread but is easier to whip up than you think? This perfect beetroot hummus recipe from BioBalance has you covered. Who’s the fairest in the land? 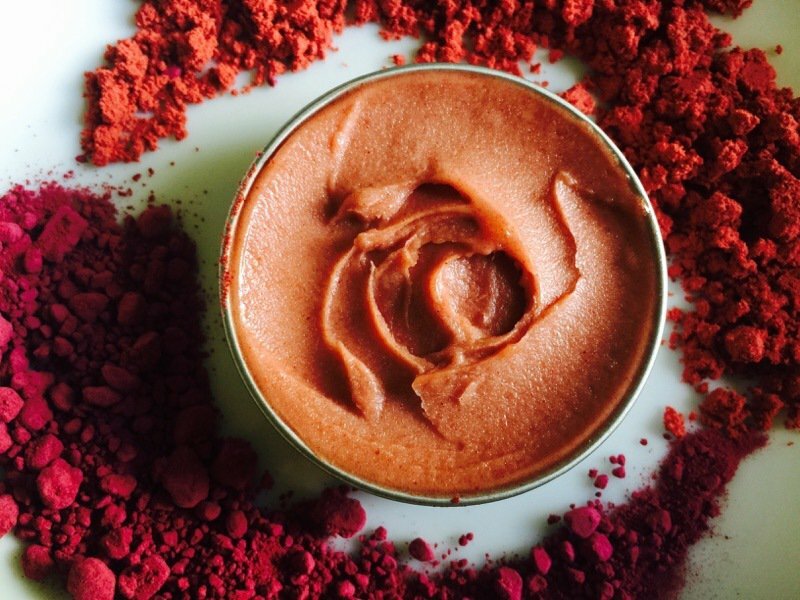 Since part of beetroot powder’s appeal is its natural pigment, it’s no small wonder that its also making an appearance in the organic beauty scene. If you’re into DIY and enjoy whipping up your own make-up try these two neat recipes. It’s becoming almost common knowledge among organic and natural living enthusiasts that you really should only put on your skin what you could eat, since your skin, your largest organ, will absorb everything you feed it. Thriving on Paleo has created some fantastic DIY natural blush recipes in various tones. And would you believe one of the star ingredients is our new darling, beetroot powder? Get your blush on. Well of course if you can add a rosy hue to your cheeks then a kissable pout is next in line. Gone are the days where we smear lipsticks filled with all sorts of ghastly animal fats on our lips. Natural oil like coconut and beeswax make great, moisturising bases and now all you need is a tint or two. Let Coconotoil.com show you how to make easy beetroot lip balm. Inspired? Get your hands on some organic beetroot powder and add a well deserved rosy tint to your culinary and beauty adventures.